Who wouldn't love to get a card saying 'you made my day'? I know I would. This bold sentiment is part of Best Day Ever stamp set, which is one of the free Saleabration stamp sets you can choose with a $90 order here in Australia during Stampin' Up! 's biggest sale of the year which goes through to March 31st. 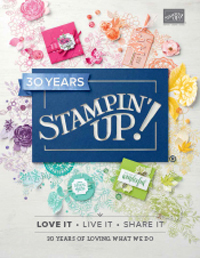 My card is based on another fabulous sketch from Sandi for the Stamping and Blogging international design team, SB92. Isn't the butterfly beautiful? You can also buy this Framelit set of 3 butterflies as a bundle with a matching stamp set and save 15%. See the links at the end of the post for more details. Here is the sketch we had to work with this week. Now it's time t visit all the other Stamping and Blogging Design Team Girls to see what they have been up to with this sketch. Have fun! Project Life Travel Album for Art With Heart Stampin' Up! Team's monthly blog hop. Hello there. Today I'd like to showcase some of the awesome stamping talent I have in my team with a blog hop among some of my direct team member's blogs. 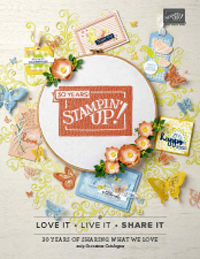 Today we focus on the new Occasions Stampin’ Up! Seasonal Catalogue and also Sale-a-bration! If you place with myself or any of the girls on the blog hop during Sale-a-bration, you can choose a free item with every $90 you spend in one transaction. There are lots of fabulous free items to choose from (ask me for a brochure and an Occasions Catalogue) and the promotion goes right through until 31st March. Better still, become part of our awesome fun, friendly and supportive Art With Heart team. 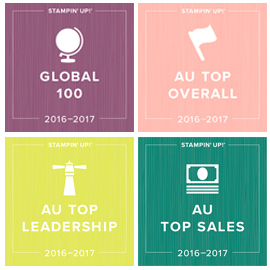 We have a really large team Australia wide that has been around since Stampin’ Up! came to Australia. We have a very active team forum and also have in person stamp days, challenges, card swaps, product shares and more. When you join during Sale-a-bration, you get to choose whatever you like from our catalogues, but pay just $169 for $235 worth of product (that’s a huge discount!) but also you get to choose between two free product options. It’s quick and easy to join online too. Ask me how! Now let’s get into showing you what you can make with the great new products in the Occasions and Sale-a-bration catalogues. You have come to my blog from the clever Kathryn Ruddick. I thought I would focus on the fabulous Project Life products available in the Occassions Catalogue called 'Let's Get Away', which as the name implies, re perfect for travel albums or holiday snaps. Here's a pic of each of each of the products (link to the actual products in my online store using the product links at the bottom of my post). The colours are really bright and happy and combined with black on a white background, really livened up my New York photos, as we had some grey skies the days we were there. Let’s keep this blog hop hopping. Next up we have Judy May. Thanks for visiting today. Don’t forget to email me at cdaly@bigpond.net.au to get a copy of the Occasions Seasonal Catalogue or Sale-a-bration brochure, or to enquire about joining the Art With Heart team. Hello lovely stampers. Today I have a vintage themed card using a very popular set from the Stampin' Up! Australia Occasions Catalogue called Butterfly Basics. The sketch I used to create the card is from Stamping and Blogging SB91. Vintage is my FAVOURITE stamping style, and the Typeset DSP I have used is my favourite DSP in the Stampin' Up! Annual Catalogue. It's ultra lightweight and feels just like it came from a vintage book. You get 24 sheets in a pack, so it's GREAT value! My flower is stamped from Butterfly Basics, and coloured with a blender pen and ink (Strawberry Slush, Rose Red and Pear Pizazz) and I've stamped on the DSP as well using Crumb Cake ink. Our new Sahara Sand lace trim, linen thread and an Antique Brad complete the card. You can link to any of these products in my online store below. Here is the sketch we had to work with this week. I used different patterned sheets of the vintage paper to create the design. Now it's time to visit the rest of the lovely Stamping and Blogging Design team girls around the globe to see what they have been up to. Hello. Today I have a little colouring for you using a new set from the Stampin' Up! Australia Occasions catalogue, called Indescribable Gift. It's a lovely set to colour, and although it comes as part of an Easter set, I have turned mine into a birthday card. The sketch is from SB90, from Stamping and Blogging. 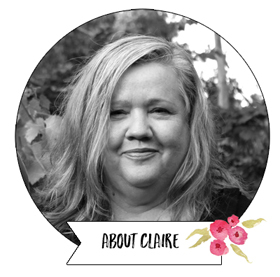 I've kept the card super simple, because I wanted the floral panel (which I coloured with blender pens and ink from the inside of the lid of my Blushing Bride, Rose Red, Pear Pizazz and Early Espresso ink pads) to be the star. All I did on the Early Espresso card was to stamp some of the same image in the Early Espresso ink, and the same on the Crumb Cake small piece. Now it;s time to visit the Stamping and Blogging design team around the world to see what they have been up to.